I am always looking for photographs of the 5,000 Civil War veterans and others who played a role in the war and are interred at Green-Wood. Their biographies went up on our website this past Memorial Day as a tribute to the men and women who sacrificed so much in defense of the Union. Those biographies are illustrated with photographs of them, to the extent that their portraits can be found, as well as photographs of some of their gravestones. And we are constantly updating those biographies with additional information (from our researchers, descendants, and other researchers). I recently had an opportunity to look through the Library of Congress Prints and Photographs Division online collection of Civil War images. They are amazing! There are thousands and thousands of them–some portraits, some landscapes. Photography began in 1839, with Louis Daguerre’s invention of the daguerreotype. The daguerreotype offered great definition, great detail, but the images were one-of-a-kind–and could not be mass produced. Of note, Daguerre sent a personal representative to America in December of 1839 to introduce photography; that man, Francois Gouraud, died penniless and is interred at Green-Wood in the Unclaimed Body Lot. Here’s a post about him. By the beginning of the Civil War, photography in America had made great strides. Photographers shot images in the field–though not during battles–typically as stereographs in 3-D. 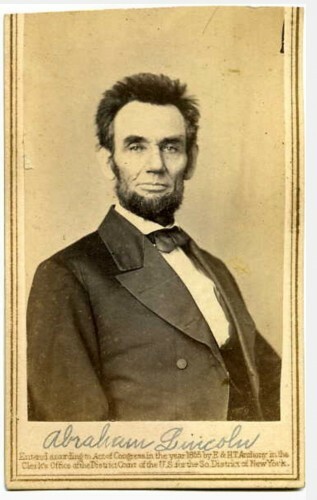 They also took portraits of individuals associated with the Civil War. 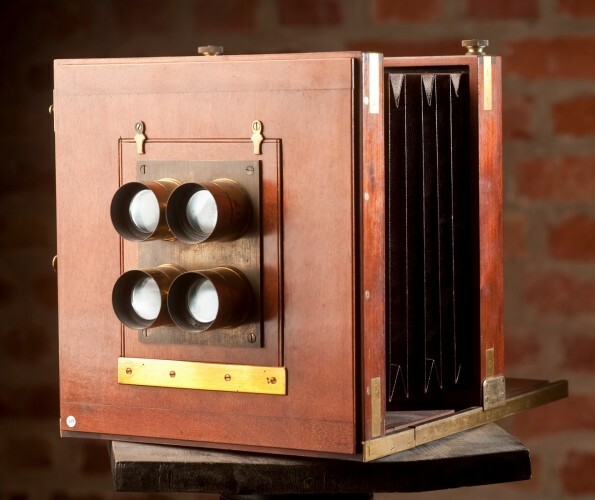 By 1861, the beginning of the war, daguerreotypes had been replaced by less expensive cased images–ambrotypes, ferrotypes, and tintypes–on glass for the first, on metal for the second and thire. However, these cased images, like the daguerreotype, had the drawback of requiring case and being one-of-a-kind images. Enter the carte de visite: inexpensive and capable of being mass-produced. Every soldier, leaving home for service, wanted a carte de visite photograph to give to his loved ones and his comrades. Carte de visite photographs–on paper–were inexpensive and required no bulky case with fragile glass to house each image. They were of modest size–a 2 1/8 x 3 1/2 inch photograph mounted on a card 4 1/4″ x 2 1/2 inches–and could be easily sent (by mail) and collected (slid into photo albums or just piled in a holder or box). Their heyday was the 1860s–which overlapped with the Civil War of 1861 to 1865. Cartes de visite photographs of Civil War soldiers were tremendously popular. These men were the heroes of their time. They faced the reality that they were off to war and might not return. For the soldiers, cartes de visite would be a final remembrance for loved one and acquaintances. For photographers, they were a source of income–to be collected by civilians who idolized military men. A small-town photographer could produce cartes de visite on demand for the locals. On the other hand, large firms, such as those of photographers Mathew B. Brady, Alexander Gardner, George S. Cook, and E. & H.T. Anthony, mass-marketed images to broad markets. Carte de visite images (the “cdv” was invented by Andre Adolphe Disderi in Paris in 1854–who used a four-lens camera with a sliding plate-holder to create eight of the same image within seconds–with two exposures, 4 lenses at a time) were printed from glass plate negatives–a sheet of glass coated with a wet collodian liquid emulsion and exposed to light focused by a lens. A 19th-century four lens carte de visite camera. Each of the lenses would have had a lens cap covering it; removal of all of the caps simultaneously (attached to each other with string or on a board) and then replacement of those lenses at or about the same time would have resulted in four identical negatives for printing en masse. With these glass negatives, images could be printed on paper as needed and could be mass-produced. So, if the market was hot for images of President Abraham Lincoln or a much-admired general–perhaps George McClellan or U.S. Grant or Robert E. Lee, an actor or actress, a clergyman or celebrity–those images could be printed on albumen paper by the hundreds or even the thousands. 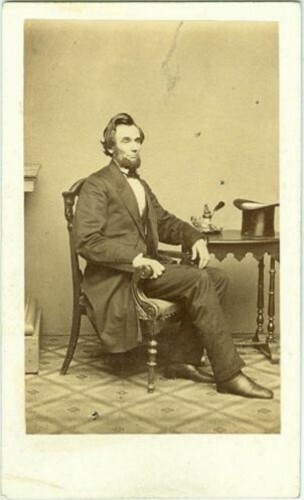 A carte de visite portrait of President Abraham Lincoln. Lincoln was certainly one of the most popular subjects in the market. The border of this card has been trimmed at the top. By one estimate, cartes de visite of America’s most famous individuals might sell more than 100,000 copies nationally. In 1862, Oliver Wendell Holmes said, “Card portraits as everybody knows have become the social currency, the green-backs of civilization.” “Cardomania” swept America, England, and Europe. It was estimated that, in England alone, just in the year 1866, between three and four hundred million cdvs were sold. That is a lot of cdvs! Queen Victoria is said to have had a hundred albums of cartes de visite. The firm of E. & H.T. Anthony (Edward Anthony is interred at Green-Wood; his brother Henry is interred at Woodlawn Cemetery) was producing 3,600 cartes a day in 1862. Using a glass plate of 8 x 10 inches, coated with a chemical mix that was light-sensitive, and a four lens camera, photographers in urban centers could remove their lens caps, expose the chemicals on the glass plate to light, and create 4 negatives simultaneously. Then they could print 4 images at a time on paper, cut them up, mount them on cardboard, and put them out for sale. 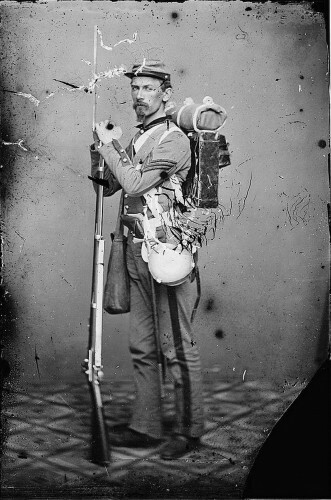 The Library of Congress has an unparalleled collection of Civil War images. It has done a remarkable job of putting digital files of these images online for free public use. These files are in several sizes for each image–from small to very large files. The large files, approximately 100 megabites, allow viewers to explore them by zooming in on details without losing definition. Below are just some of the images from the original glass plate negatives at the Library of Congress of Civil War soldiers and sailors who are interred at Green-Wood. They are extraordinary in their sharp focus and they offer strong blacks. The Library of Congress does not identify the photographer, but I believe, based on their uniform quality and the sheer number of them, that they are by one of the largest and one of the most prominent photographic studios operating in the North during the Civil War. The first such studio that comes to mind is that Mathew Brady and his operators (as his photographers were known). 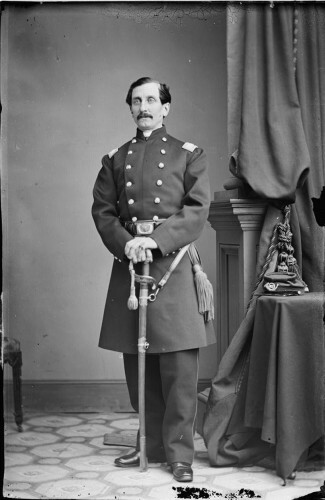 And, I conclude that that is the case with the images below–that these are all by the most prominent photographic studio of the Civil War–that of Mathew Brady–with branches in New York City and Washington, D.C.
Brigadier General Thomas Sweeny. An Irish immigrant, he loved a fight. Sweeny fought in the Mexican War, losing his right arm. He fought in the Civil War and recruited Irish immigrants just as they “came off the boat.” And he led the Fenian invasion of Canada in 1866, hoping to capture Canada and trade it for Irish independence. Here four lenses captured four images simultaneously on a single glass plate. Four prints could be made from this negative, then cut into 4 individual cartes de visite. Because this is a negative, it will print reversed–and the negative number and name at upper right, which appear to be backwards. will read correctly. Chaplain Gordon Winslow. He served honorably as the chaplain of the 5th New York Infantry, headed the field operation of the Sanitary Commission at Gettysburg (with his wife, running its operations in the wake of that three-day bloodbath), then served as chaplain of the 5th New York Veterans. He drowned in the Potomac River while accompanying his mortally-wounded son to a hospital; his body was never found. Note the identification of the photographer’s studio: “Brady NY,” next to his left foot And notice that this flooring matches that in the photographs below of Nathaniel Prime and Edmund Cobb Charles –their photographs can be attributed to Brady’s New York studio on this basis. Below are several triple negatives; they may have been shot with a camera that was made to take stereoscopic views, but was modified to hold three lenses across. 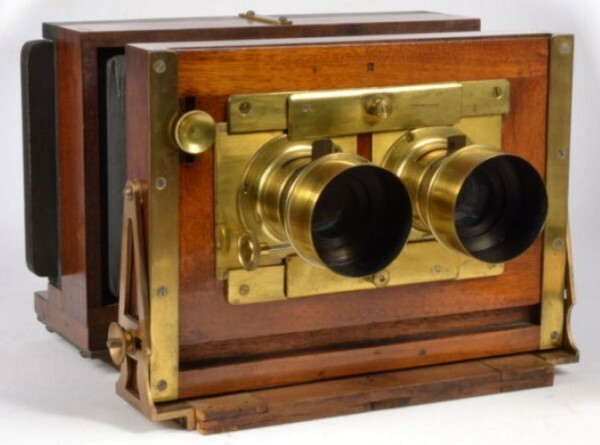 A 19th-century stereoscopic camera with two lenses. With these two lenses, a negative could be exposed that was approximately 6″ x 3″. Two slightly-different images, captured at approximately the distance between a typical human’s eyes, made it possible to see a 3-D scene when viewed through a special viewer. These lenses were removable; it three lenses were substituted, that may have been how the negatives below were created. 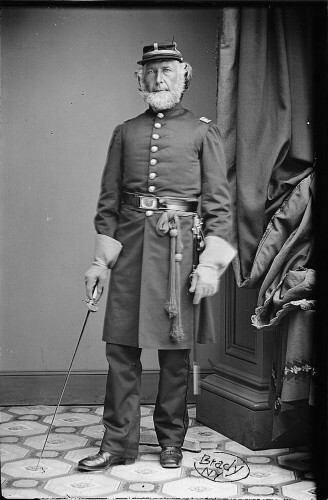 Lieutenant Colonel Ferrier Nazer of the 4th New York Cavalry. A veteran of the British Army, he commanded his regiment at the Battle of Cedar Mountain and died in 1863 of typhoid fever. Colonel Julius Walker Adams commanded the 67th New York Infantry. He was an engineer who, though he had never built a bridge of consequence, was hired after the Civil War to come up with a low ball estimate for the construction of the Brooklyn Bridge. He estimated $5 million; it ultimately would cost 3 times that. He is seated with Napoleonic pose of hand in jacket–a very popular choice for Union officers. 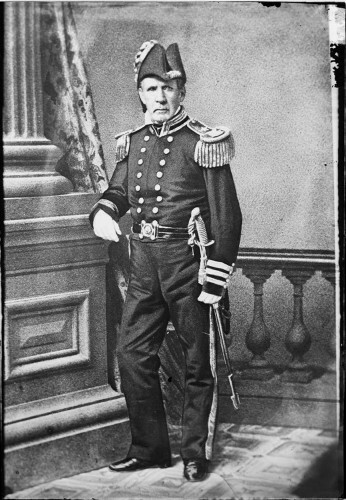 A civil engineer, specializing in bridge construction in Ireland, Colonel William Allen has the distinction of being the first Union officer court martialed during the Civil War. Brevet Major General George Washington Cullum. Here both the subjects name and the negative number are written on the negative. Note the slight variation in the turn of his head; you can see it in the amount of his white collar exposed in the image at left, much more than that shown in the other two (seemingly identical) images. 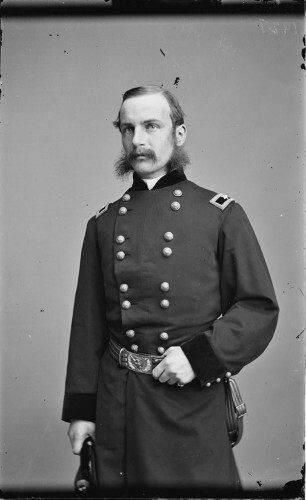 He was an engineer who served as chief-of-staff to Major General Henry Halleck (shown below), who commanded all Union armies during the Civil War. This is one of the most fascinating grave layouts at Green-Wood. 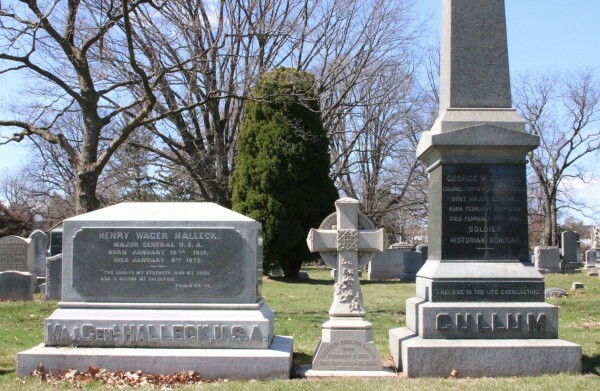 After General Cullum’s boss, Major General Halleck, died, Cullum, apparently intent on carrying on Halleck’s legacy, married Halleck’s widow–who also happened to be Alexander Hamilton’s granddaughter. She is buried between the two generals. We see some of the variations in the poses in the group of photographs show in this post: some subjects are seated in a chair, others stand with a table nearby, hold a hat, have a hat resting nearby, or place their hand on a sword. Still others stand next to a column or place their hand tucked into their uniform, like Napoleon. 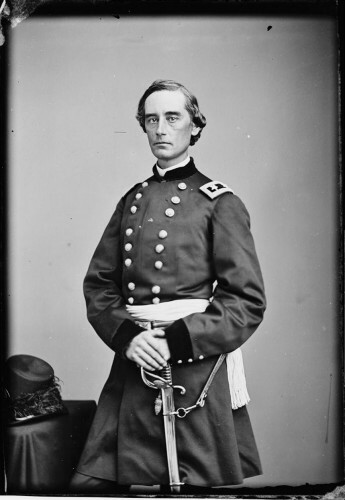 Brevet Major General Edward Fowler. He commanded the 14th Brooklyn during the heavy fighting at the Railroad Cut at Gettysburg on July 1, 1863. Note that, in the image at left, Fowler looks directly at the camera. But, in the other two identical images, he looks to the area to the left of the camera–and all three images are otherwise similar. A single glass plate, coated with emulsion, would have been placed in the camera’s plate holder without exposing it to light. Then the lens cover over the part of the glass plate at left or the two at center and at right would have been removed to expose their respective parts of the plate, then replaced. Major General Henry Wager Halleck, who commanded all Union armies during the Civil War. By all accounts, he was a very smart man who had few people skills; Lincoln said of him: “I am his friend because he has no others.” An interesting composition, with the column framing the portrait. Note the emulsion at far right is missing, perhaps worn off in handling- creating that black area near the edge. Brevet Major General James Jourdan. A very busy composition, with curtain, sash, sword, gauntlets (gloves), boots, and chair. He started his Civil War service with the 14th Brooklyn and served with great distinction. After the war, he led Revenue Service raids on Brooklyn moonshiners and served as Brooklyn’s police commissioner, president of its Board of Health, and president of the Brooklyn Union Gas Company. This carte de visite of Abraham Lincoln, the president-elect awaiting his inauguration, was taken on February 24, 1861 at Brady’s photographic studio in Washington, D.C. Note the flooring–it appears to match that in the James Jourdan image above and the Joseph Dore and Locke Winchester images below, making it likely that the all of these images were taken at Brady’s Washington, D.C. studio. Major General Fitz John Porter. A gallant soldier, he was the victim of political reprisal and was thrown out of the Army in the midst of the Civil War. He spent decades trying to clear his name, ultimately doing so. His epitaph on his gravestone: “I have fought the good fight.” The negative number is at top right of the center photograph. Note all the dead space above Porter’s head–not a great composition by the photographer. Colonel John Lafayette Riker. He was court martialed for keeping a woman in his tent, but was exonerated, only to die at the Battle of Fair Oaks as he bravely (according to several eyewitness accounts) led his regiment. Note the change in the location of his head in these photographs; in the image at left, he looks straight ahead, consistent with the angle of the chair; in the images at center and at right, he has turned his head to look directly at the camera. Here is a photographer trying two different poses on a single plate, but still making it possible to print all three images at once. Commodore Henry W. Morris was a lifelong Navy man. He began his service as a midshipman in 1819 and served during the Civil War into 1863, when, in failing health, he returned home and died soon thereafter. Major General Schuyler Hamilton, grandson of Alexander Hamilton and brother of Elizabeth Schuyler Hamilton Halleck Cullum (discussed above). A West Point graduate and instructor, a veteran of the Mexican War (in which he received a lance wound that would bother him for the rest of his life), he served in the Civil War from 1861 to 1863, when severe health issues forced his resignation. He died in 1903. Colonel Edmund Cobb Charles commanded the 42nd New York Infantry–the Tammany Regiment. He was severely wounded and captured at White Oak Swamp in Virginia. Confined at the notorious Libby Prison in Richmond for several months, he was released and discharged for disability, then died a month later from his wound. The carpeting here seems to be that of Mathew Brady’s studio in New York City, at 11th Street just west of Broadway–see also the carte de visite photograph of Rush Hawkins below. 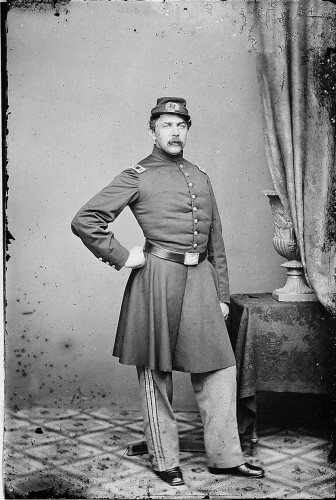 Sergeant Joseph Dore of the 7th New York State Militia, wearing the gray uniform of that regiment. Note the distinctive carpeting here is different from that of Mathew Brady’s New York photographic studio–it seems to be that of Brady’s Washington studio. When he applied for a passport in 1873, Dore was described as 5′ 8½” tall with a high forehead, black eyes, black hair, dark complexion, full face, and prominent nose. After the war, he was in the shoe and boot business. Lieutenant Colonel Edgar Addison Kimball, who was killed (by some accounts murdered) by General Michael Corcoran. 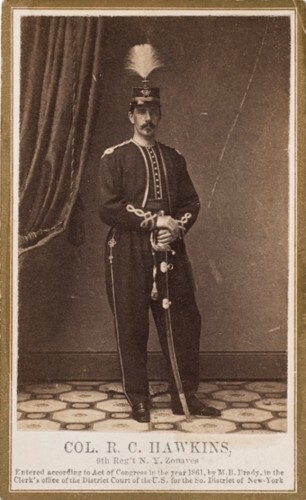 He wears the distinctive uniform of the 9th New York Volunteer Infantry–Hawkins’ Zouaves (see the next image for more on this). This uniform was dark blue with yellow trim and red hat. This carte de visite is not from the Library of Congress. And Rush Hawkins is not interred at Green-Wood. But the copyright notice for Mathew Brady at bottom establishes his New York studio as the photographer–and there’s that floor again! Note the uniform, which matches that worn by Lieutenant Colonel Kimball. The uniform of a 9th New York officer, in color. 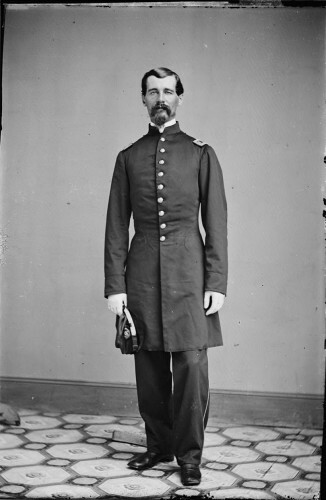 Brevet Lieutenant Colonel Nathaniel Prime, 17th Infantry, United States Army. Note Brady’s New York studio carpet. Prime served in the U.S. Army into 1879. 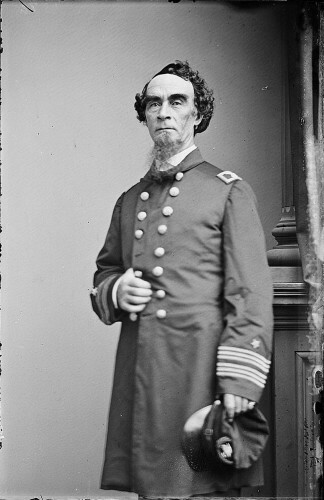 Commodore Henry Walke was born on a Virginia plantation and entered United States Naval service in 1827. He served in the Mexican War and was in the middle of much Naval warfare during the Civil War; he claimed that he “fought more for this country than any other officer in the Navy.” Note how shallow the depth of field is here–his face is as sharp as could be, but his hat and left arm, just a few inches closer to the camera than his face, are slightly out of focus. 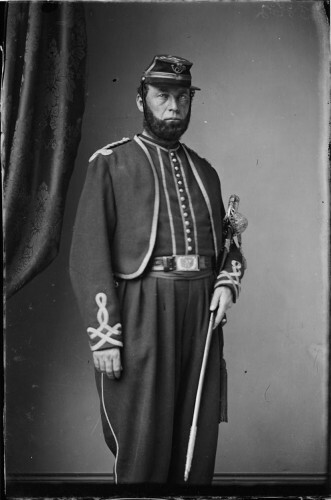 First lieutenant and Quartermaster Locke Winchester of the 7th New York State Militia. He was active in veterans affairs after the war. There’s that Brady carpet again–from the Washington D.C. studio! 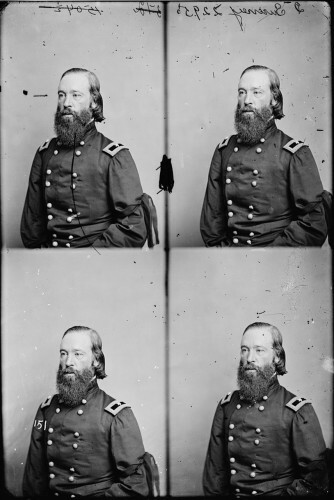 Brigadier General Frederick Winthrop. He was killed at Five Forks in Virginia, just days before Confederate General Robert E. Lee surrendered his Army of Northern Virginia and effectively ended the Civil War. Note that the liquid emulsion seems not to have been applied all the way to the edge of the glass plate at top and bottom–hence those dark areas. The Library of Congress shares its magnificent photographs with the American people, who own them. I am happy to have been able to share some of those images, and a few brief stories, with you. Thanks, Library of Congress! Abraham Lincoln, Edgar Addison Kimball, Edmund Cobb Charles, Edward Anthony, Edward Fowler, Elizabeth Schuyler Hamilton Halleck Cullum, Ferrier Nazer, Fitz John Porter, Francois Gouraud, Frederick Winthrop, George Washington Cullum, Gordon Winslow, Henry Halleck, Henry W. Morris, Henry Walke, James Jourdan, John Lafayette Riker, Joseph Dore, Julius Walker Adams, Library of Congress, Locke Winchester, Mathew Brady, Nathaniel Prime, Rush Hawkins, Schuyler Hamilton, Thomas Sweeny, William Allen, William Brewster. Great post! I much appreciate your blog bringing these thoughtful and interesting studies into my home where I can study them and learn at my leisure. You are truly spreading civilization! I enjoyed your blog very much and appreciate all of the research that you had to do to make it possible. I am a Civil War collector and historian, specializing in the 9th N.Y.V.I. (Hawkins’ Zouaves) and Civil War magic lantern slides. 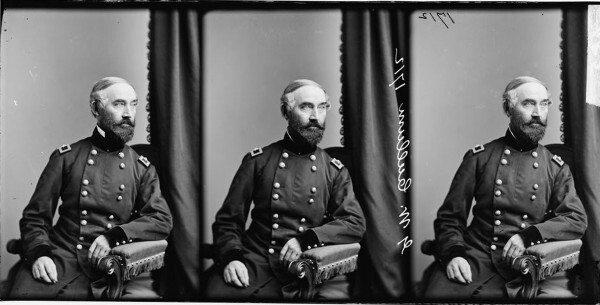 As a FYI, the images of Colonel Rush C. Hawkins and Lieutenant Colonel Edgar Addison Kimball are wearing the first staff officer’s uniforms as they left the city in 1861. The uniform in color was conceived by Col. Hawkins for his uniform, however there were some changes. Col. Rush C. Hawkins Staff Officers Uniform was manufactured by Brooks Brothers, NY, NY. It was made of the finest materials obtainable at the time (wool, silk, and linen). Both the jacket and vest are made of dark wool. The jacket, similar in cut to the enlisted men’s pattern, was trimmed in gold braid and with two sets of rank designations. On the shoulders in a Russian knot pattern and on the sleeves in a Hungarian knot with spaces filled with red wool. The eagle insignias are handmade by first making a templet, padding and stitching, and then applying the bullion. The vest is notable for the numerous buttons on a red wool strip bordered by gold braid. The trousers were similar to the enlisted men’s with the exception of fine lines of gold braid strips in an intricate pattern near the hip of the wearer, which then ran straight down the length the leg. I have other images of Lieutenant Colonel Edgar Kimball and other’s from the regiment that is buried in Greenwood. I would enjoy sharing them with you. Thanks, Dennis. That’s a great help. I am always a bit nervous when commenting on Civil War uniforms–because that is not an area of expertise for me and there were so many variations. So I very much appreciate you sharing your knowledge here. By the way, the Brooks Brothers, who you note were the makers of these uniforms, are also interred at Green-Wood. I will be in touch with you by e-mail–I would love to see the other 9th NYV images you have.